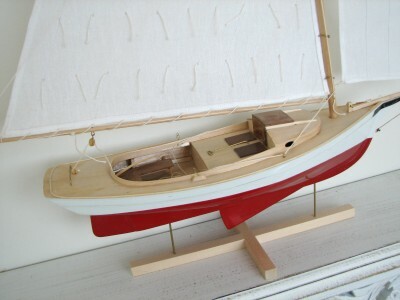 This Midwest Products Bay Lobster Smack was the first of two models that I built at the request of my wife, Melanie. She originally purchased the two kits to build herself, but decided to leave the task to me. 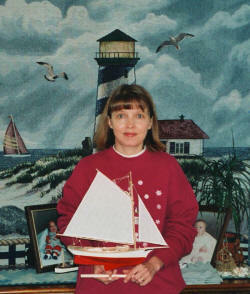 She did volunteer to sew the sails for me, though. The model went together fairly easily. There were a lot of small wood and wire parts to cut, sand and form. Painting was not too much of a challenge, except I made the mistake of using clear butyrate dope on the deck as a final finish and on the bottom as a grain filler. That cased some compatibility issues when painting the white enamel on the bottom (not really sure why). I ended up removing the dope and applying Deft gloss clear (a lacquer). 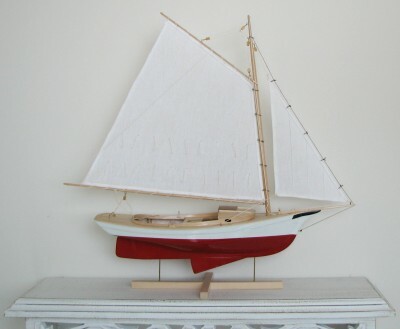 I used the Deft as a base/filler when I later built the Midwest Products Sharpie Schooner. Muscongus Bay Lobster Smack. A small sloop that could be worked by two men, used along the Maine Coast from the 1860's to the turn of the century for catching lobsters.